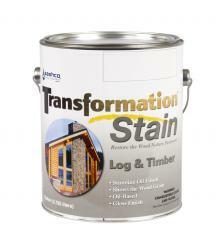 Transformation Stain Log and Timber is the finest quality log stain you want to refurbish your log home. Its superb color range and polished finish showcase the distinctive personality of your logs and timbers. Transformation Stain Log & Timber is specially formulated to be chemically well-matched with even the most tricky stains and coatings, making it the go-to product for even the hardest restoration projects. Check out the different color selections below.